You can find scented candles in just about every home, and for some people in every room. Scented candles are a part of most people’s everyday life. They have become a multi-billion dollar business worldwide. However, under the beautiful packaging and the nice scent are a number of toxic chemicals that are linked to some major health problems. So, why are so many people still using them? Simply put, scented candles are an easy way to mask odor that are readily available to buy. When you start breaking a candle down, they are really just a huge source of air pollution that looks nice. Some of the chemicals that scented candles contain are considered to be at the danger levels of second-hand smoke. Most of the scented candles on the market are made from Paraffin, which is a waste product that comes from the petroleum industry. It is deodorized and bleached, before it is made into wax. When this wax is burned, it releases carcinogenic chemicals. These chemicals can also cause other respiratory issues, and are the same ones that are found in diesel fuel fumes. Soy based waxes have become popular in the last few years, as they burn longer and seem to be more eco-friendly. The problem is that many of the soy based waxes are made from GMO soy. GMO soy is not a problem for some people, but if you prefer to be GMO free, check with the company. In 2009, researchers at the South Carolina State University tested both the paraffin candles and vegetable-based candles that were non-scented, not pigmented and free of any dyes. The report found that the vegetable-based candles did not create any potentially harmful pollutants. However, the paraffin candles were releasing unwanted chemicals into the air. In the United States, candle wicks are only being made from cotton or paper. However, there are a handful of candles on the market that contain lead and other heavy metals in their wicks. They make up about 30% of the scented candles. If you were to burn one of these candles with heavy metals in the wick, the amount of heavy metal in the air would be much higher than the acceptable limits. Lead can cause damage to the central nervous system, along with respiratory issues. Have you ever wondered about how the scent is created in a scented candle? For most fragrant candles, it is with artificial scents. Many companies also use artificial dyes to color the wax of scented candles. These both have huge amounts of chemicals that are released into the air once the candle is lit. There are many, different chemicals that go into making these artificial colors and scents, so there is really no way of knowing exactly what chemicals are being released into the air. Many of these chemicals can trigger allergic reactions. Anne Steinemann, an environmental pollutant expert from the University of Melbourne, has found toxins like benzene and toluene in scented candles. These chemicals do not just damage the lungs, they also cause damage to the brain and the central nervous system. Developmental difficulties have also been linked to these chemicals. These are the three main components in the candle making process. However, there are thousands more chemicals that you can find used in paraffin candles. Some of the chemicals are Acetone, Carbon Disulfide, Carbon Tetrachloride, Tetrachloroethene, Xylene, Cresol, and Phenol. These chemicals are regularly found in paint thinners, paint, varnish removers, and lacquer. Nearly all the products that these chemicals are found in require you to wear a breathing mask when you are using them. These chemicals are powerful and dangerous. They can cause allergic reactions, breathing problems, and some are even carcinogenic. If you still want to have scented candles in your home, there are some candles that you should out right avoid, and some that are your best option. When you are looking to buy candles, avoid the dollar store or super cheap candles. Most times, they will use cheap materials to make the candles, which equals more toxins. They may also be imported, so they don’t have to adhere to the strict guidelines that North American candles have to follow. Gel candles should also be avoided like scented candles. They may look nice; however, there are extra chemicals added to keep them in that jelly state. Febreeze, Glade, and other cheap aromatherapy candles should also be avoided. To be truthful, there is nothing therapeutic about the scents these companies use and they are some of the worst producers of the artificial scents. If you still like scented candles, and are going to shop at a major retailer, pick higher end candles. These higher end candles are less likely to use heavy metal in the wicks and have synthetic scents. Make sure to check closely since some high-end candles still use synthetic scents. Taper candles are another option to think about, as they are less likely to contain lead, next to tea lights. The best options for candles are beeswax and soy candles. Beeswax are pricey; however, they are the healthier option of the two. Beeswax is created by bees, and is collected by beekeepers. Beeswax has a natural scent of honey, which is very light. Most of the beeswax candles are scented with essentials oils, which nearly all are safe to burn. The most common colors of beeswax candles are normally off white, light brown, and yellow. However, non-toxic dyes can be used to dye the candle to the same bright colours that are found in major stores. When you want to buy a beeswax candle, you should look for one that is labeled 100% beeswax. Some brands will label their candles ‘beeswax candle’ and still have paraffin in them. This is allowed as long as there is beeswax in the candle, or you can simply make your own. There are many guides online to show you how to make your own candles. You can also buy beeswax sheets online, but your local bee farmer may have beeswax sheets for sale. Beeswax candles come in all shapes and sizes, if you are willing to look for them. Beeswax candles also have the benefit of emitting negative ions. Negative ions are great since they reduce the amount of charged ions in the air. Positive ions or charged ions are made by other scented candles, electrical devices, heating and cooling systems, and even walking across a carpet. While the ions themselves are not damaging, they can carry dust, pollen, and mold. When negative ions are added to a room, they bind to the positive ions and are not floating in the air as they are too heavy to stay airborne. Soy candles are a great option,soy candles burn for a really long time, and don’t have any harmful fumes. Like beeswax, soy candles can be found in just about every color and natural scent out there. However, soy candles are easier to find and are much cheaper than beeswax candles. You will need to look for a 100% soy label as well, as some makers will add paraffin to the mix to lower the price of the product. There are also soy wax candle making kits and guides available online. There are also blended beeswax and soy candles on the market. These candles use a mixture of both beeswax and soy wax to make the candle. These candles have benefits from both ingredients and come in a wide of variety of colors and shapes. You need to make sure that the only waxes the company uses are beeswax and soy, since some candle makers will try to sneak Paraffin into their candles. Toxic scented candles that are available in just about every store and home do not look they are going to be removed from the market any time soon. The candle market has grown into a mutli-billion dollar industry in the past few years. 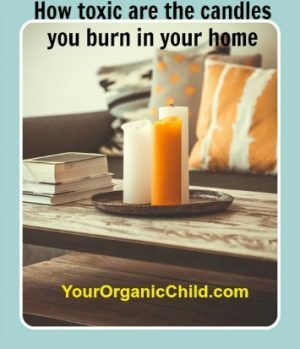 Making the switch to beeswax or soy candles is the best option for you and your family’s health. You just need to check the ingredient list to make sure that you are buying pure products. There many online shops to pick from, and most areas have at least one candle maker that may use one of the pure waxes. If you feel creative, you can also learn how to make your own pure candles.